December is in full swing here in Driggs, and I'm loving the variety. Snow depths are good - not great, but good enough to ski or ride - and it's plenty cold (below zero nights with highs in the teens the past couple of days). So, the challenge is choosing your sport for the day, dressing in layers, and getting out the door...because daylight is fleeting this time of year. 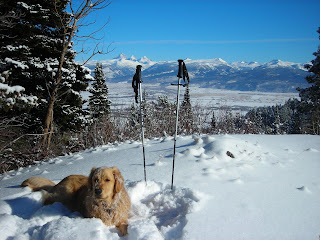 Here's a photo from a mid-week lunchtime snow hike in the Big Holes with Bridger, where the light and the Teton vistas were incredible. I never grow tired of moments like this. 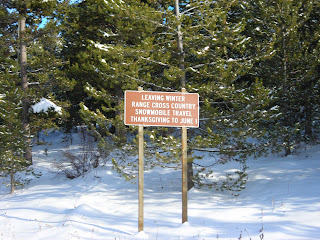 I've always loved these signs delineating "winter range." They're ubiquitous in the forests out west, and exist primarily to protect natural winter feed areas for the elk and deer. Somehow, they make you feel like you're really out in the backcountry, even if you're just a couple miles up a canyon or (heaven forbid) driving on pavement. They also infer that our winters are ridiculously long...we could only wish for cross-country snowmobiling until June 1 (truthfully, we're ready for golfing and boating by June). 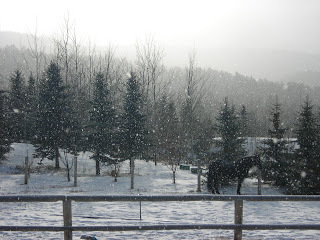 Sunday was one of those unsettled days: partly sunny to mostly cloudy, snowing lightly, and cold. I'm learning those are perfect conditions for snow biking, so Joanne and I broke out the Pugsleys, dressed in layers (and layers and layers), loaded up the dog and headed out for an afternoon ride in the Horseshoe-Packsaddle canyon area. 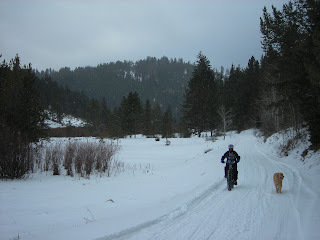 I have to admit, it's almost comical to be unloading bikes at a snowmobile trailhead in December, in Idaho. 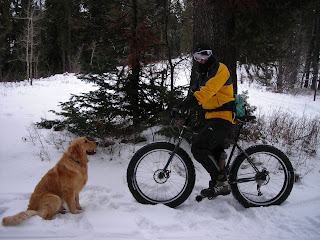 But, it's good to share the trails, and everyone is intrigued by the 4" wide manly tires and this relatively new sport. My perfect day would honestly be a couple of hours on the snow bike or skis to get the blood flowing, then a couple of hours on the snowmobile to really cover some ground. It all beats working. I couldn't believe how well Bridger kept up with us. After 11 years with Targhee (R.I.P. ), the last 4-5 years we had to rein in the efforts with him. Now, with Bridger, it's amazing to watch a 9-month-old bundle of energy bound through the woods and plow through chest-deep snow with a permanent grin. He even found time to chase squirrels while we labored up the steeper hills. The ultimate bonus: he slept like a baby afterwards. Sunday Night Football was oh-so-peaceful.